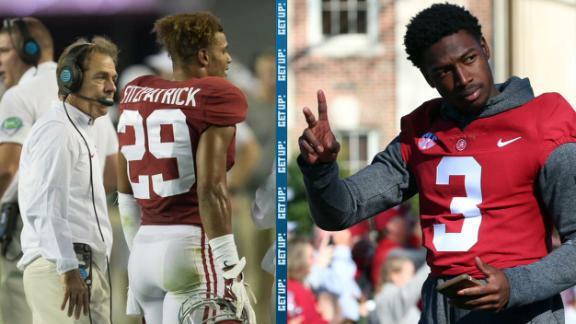 Nick Saban shares his thoughts on how former Alabama players Minkah Fitzpatrick and Calvin Ridley will fare in the NFL. Todd McShay breaks down the skills that make Calvin Ridley a good receiver and a great pick. Mel Kiper Jr. ranks Alabama's Calvin Ridley as the No. 1 receiver in the 2018 NFL draft by a large margin. Nick Saban leads Alabama to a dominant victory over Mercer and their eleventh win of the season. Kevin Carter, Charles Arbuckle and Mike Bellotti discuss why Clemson QB Deshaun Watson and Alabama WR Calvin Ridley will be the best players on the field during the BCS National Championship game. Alabama WR Calvin Ridley discusses the moment he realized he was playing college football and not high school, and what coach Nick Saban's message to the team was after their loss to Ole Miss early in the season. After Alabama scores three points in the first half, Jake Coker throws two touchdown passes and the Tide finish strong in the second half of a 27-14 win over Arkansas. Josh Parcell and Craig Haubert discuss the performances of freshman WRs Calvin Ridley and KaVontae Turpin, and why DE Josh Sweat is the freshman to watch in Week 6.